I haven't had hot pepper jelly in years but I remember my mom serving it over cream cheese as an appetizer & it being so good. I decided it was time to add it to our canning repertoire especially when I saw how easy it is to make. Ok, you can't really see the peppers in this jelly as they are all at the top (Does anyone know how to prevent this?) but believe me they are in there & the flavor is really through the whole jelly. I tasted a little of it from what was leftover in the pan & the flavor is as good as I remembered, slightly hot but sweet at the same time. Actually I think it was even better than I remember. I chose to can this jelly in 4oz jars as it seemed the perfect amount for one appetizer serving to me. Prepare seven 4 oz jars & lids by boiling the jars for 20 minutes & the lids for 5. 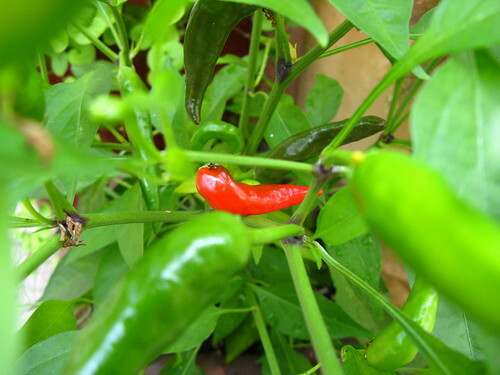 Place the jalapenos, sugar & vinegar in an enamel or stainless steel saucepan. Bring to a boil over medium high heat while stirring. Let boil for 1 minute, stirring the whole time. Stir in the pectin & bring back to a hard boil. Boil while stirring for 1 more minute. Skim off foam. Ladle hot jelly into the hot jars leaving 1/4-inch headspace. Wipe the tops of the jars clean. Top with lids & hand tighten on neckbands. Process in boiling water for 10 minutes. Turn off the heat let sit for 5 minutes. Remove jars to a rack & allow to cool untouched for 12 - 24 hours. The lid of the jar should pop & pull downward. Any jar that doesn't pop should either be reprocessed or stored in the fridge. How many did you plant? We had just one (our first time) and we're thrilled with the five thumb-size peppers that it produced. After I master canned honey and apples, I would love to try this out! I make a version of this too, but it also has bell peppers, and is delicious. I agree that the 4oz jars work best; we always end up throwing away some if we put it in bigger jars, because as good as it is, we can only eat so much of it at a time. I have used a recipe similar to the last comment. It also has bell pepper in it. The book is The Bountiful Kitchen by Barry Bluestein and Kevin Morrissey. It is an awesome book. You two would love the canning recipes in it. Tomato Orange Marmalade, Honeyed lemon Poppyseed Jelly, Tomatillo Lime preserves.... I can't stop. Anyway, check with Amazon, I bought mine used for 3.00. Totally worth it. First, I found it in the library and had to have it. But, my true point is, for their recipe, you place the jars upside down after the 10 minute bath and allow to cool overnight. My jelly turned out with peppers throughout. The same process is used in that aforementioned poppyseed jelley too. Heidi - Interesting I'll have to try that next time. I have some hot pepper jelly to use up. It is good on sandwiches too. Its been so long since I had some. I have a whole pile of hot peppers in my fridge and this is a great way to put them to use. Can you ever have too many hot peppers? Great article. Thanks. I like to eat pepper jelly on vanilla ice cream. Sounds like a delicious way to preserve the season - yum! 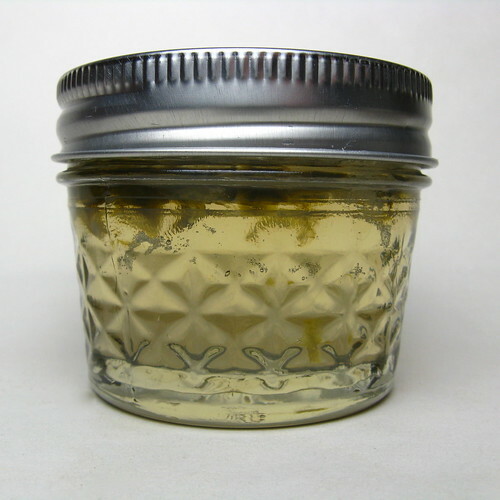 I made some raspberry jalapeno jelly last year (from AllRecipes). I diced everything small and strained it. Still get the flavor and the color is gorgeous. Love this blog! So happy to have found it. I just made a similar recipe for hot pepper jelly with some habaneros, tabascos, and cayennes, and my recipe had me puree them with cider vinegar in the blender prior to adding the sugar, more vinegar, and pectin. It came out beautifully, with little teeny flecks of multicolored peppers throughout the jar. I also pureed the peppers and vinegar before adding to the sugar and pectin, and the peppers were dispersed beautifully throughout the jam. I puree my peppers and vinegar too and never have a problem with them floating to the top. I use the canning book from "Ball" canning jars.... it's online as well! Happy canning. You have to rotate the jars top-to-bottom every ten minutes or so while cooling to distribute the peppers until the contents are thick enough to hold them in place. You can also use a mini-whisk initially. My family has been making pepper jelly for many decades and that's the way they have always done it. Pepper Jelly is fantastic on pb & j sandwiches! We like peach pepper jelly the best but any will do. I think it looks more attractive with all the peppers at the top. If you're serving over cream cheese, a quick stir fixes it!